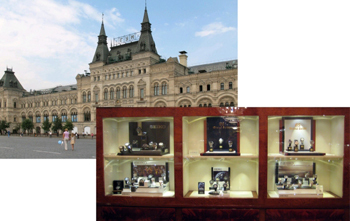 Grand Seiko collection known Japanese company Seiko, which for many years was only available in Japan, is now available in Moscow. In December, the collection represented by three hours with the caliber of Spring Drive and 5 models with automatic movement, was exhibited at the Salon Sublime by BOSCO in Moscow’s GUM. It is now available only chronograph collection Spring Drive GMT Chronograph in titanium and a model with a high-caliber Grand Seiko Hi-Beat 36,000. Near the Grand Seiko collection at Sublime in GUM are collections of Ananta and Astron.